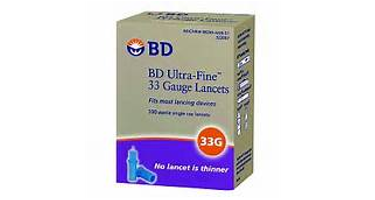 BD Ultra-Fine 33 gauge single use lancets are designed for your comfort. The 33 gauge lancets are available for maximum comfort during diabetic testing. These lancets are designed to fit most lancing devices including: Medisense, Microlet, Penlet Plus/One Touch UltraSoft, Prestige LX, OneTouch, Freestyle, Microlet 2 and many more! A higher guage means a thinner lancet, which allows for greater comfort.